One of the best things about the Neclos Fortress keshi line is the incredible range of characters it offers. You've got your standard mythological monsters, your original characters (like main bad guy Neclos himself), your heroic warriors, Lovecraft-based creatures, and so on. Strangely enough, the makers of the line even went so far as to include a number of "actual" angel and demon figures from religious texts. Yes, this is a line that finds Gabriel the archangel and Lucifer existing alongside a killer apple. 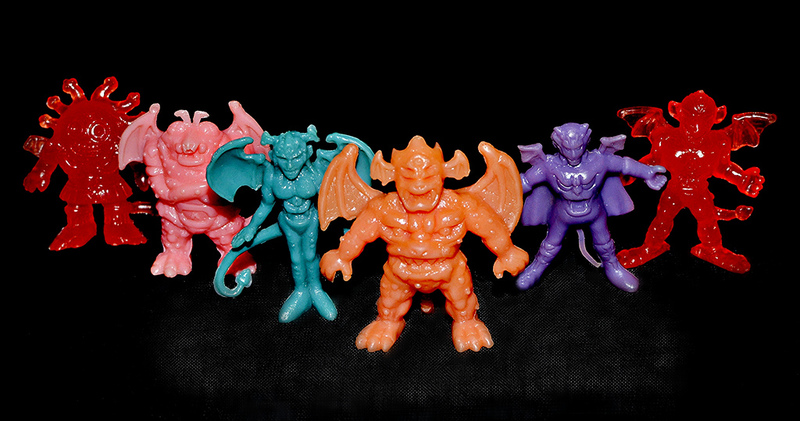 The Neclos toy line was made as eight different "parts," with each part containing 40 unique figures. In parts three and four, a number of demonic deities were tossed in. In part seven, a group of archangels made an appearance. Why exactly were these included in the line, and what significance do they play in the Neclos story and game? Hell if I know, because it's all in Japanese. But my best guess is that the angels are used as allies to help in a hero player's game, and the demons are just another subset of evil-doers for players to defeat. In the photos above, you can see the various angel and demon figures. Below is a list of them. I believe they're all based on figures from ancient texts, except for the orange winged beast, Neclaga, who is a character original to the line that I included because I thought he went well with the demons. If you have more information on exactly what function these figures play in the line's story and game aspect, please fill me in. What I do know for sure is that their inclusion only makes Neclos Fortress that much more of an intriguing toy line. For much more on the Neclos Fortress toy line, check out another site of mine, the Neclos Fortress Collectors Archive. Great write up! I'd like to know what role the angels play in the game too.. Neclos fortress is amazing! Thanks Justin! Hopefully one day we can get a complete translation of the storyline. I hate the "chibi" look to the angels. Doesnt fit the line at all.